One question I frequently hear from many different people is “what is the best cardiovascular exercise for the fast burning of body fat?” My answer is typically always the same, as my own personal experiences have shown me that sprint intervals for fat loss are some of the best exercises on the list. Of course, running and cycling are good exercises. 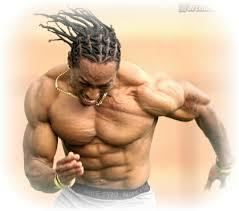 Nevertheless, they are not as effective as sprinting for those who want to burn body fat at a rapid pace. Below are some suggestions if your goal is to gain muscle, while quickly losing fat at the same time. Outdoor sprints are my favorite cardiovascular exercises. These include lowercase Hill sprints and HIIT sprints completed on a treadmill. I also recommend body weight HIIT workouts, such as bicycle crunches, high knees, mountain climbers, box jumps, burpees and pushups. These exercises are some of the best choices for burning fat more quickly than you have been with traditional cardiovascular workouts. Not only will they help you burn calories and fat in less time, if you stay consistent they will also ensure that you get into the best shape of your life. However, when doing such exercises, you must be sure to train with an adequate amount of intensity or you may not enjoy optimum results from your efforts. When completing any type of high intensity workout where your body is pushed to its limits with infrequent rest periods, you will notice that your breathing becomes heavy. This is how you can be sure you are pushing your body to the limit, as this is the science behind sprinting: moving at the fastest speed possible for a short amount of time. In most cases, a good sprinting session can be completed in 8 to 10 minutes, and before long, you will find yourself blasting off body fat and discovering new, well-defined muscles. If you are like most people, you would probably agree that 8 to 10 minutes of intense exercise certainly beats running on a treadmill or race walking for an hour. Of course, as you may have suspected, running long-distance is still an enjoyable activity. I even participated in several triathlons in recent years, during which I had a great time, but with regard to getting ripped ABS and blasting away fat, nothing holds a candle to sprint training. Obviously, not all men can suddenly begin sprinting at a high intensity if they have not yet reached a certain fitness level. Similar to any other exercise, effective sprinting takes practice and requires that you be in excellent physical shape before you begin. If you feel you are not at that level, keep up with your current cardiovascular workouts and weight training and then try a five minute sprint to “test” your level of physical fitness. If you feel winded, but able to continue, you can try an 8 to 10 minute sprinting session. If you are like me, and your goal is a six pack, strong muscles and continuous fat burning, consider doing weight lifting most days, and sprinting once or twice a week. You will be amazed at the results you see and how quickly they manifest. I do sprinting once a week and weight lifting every other day and have been quite pleased with the outcome. I know many people who do not even consider doing sprint training or HIIT workouts because they would simply rather stick to standard aerobic exercises that do not require a high amount of energy and physical effort. Each person must make this choice for himself, but keep your ultimate fitness goals in mind when you are making this decision. If you are like me and want six pack abs and a bodybuilder’s legs, you may have to consider sprint training and HIIT workouts to reach this goal. However, HIIT is not for everyone, and ultimately you must make your own decision about whether or not to embrace this type of exercise. If you have never sprinted before, you owe it to yourself to at least give it a try. Sprinting is for essentially anyone who wants to lose weight at a rapid pace. Keep in mind, however, that you do not have to go crazy at the start. Rather, take your time and let your body slowly get used to this type of workout. Furthermore, if you are honest, you can probably agree that running was even more fun when we played kiss chase games with the girls. Remember some of those good-looking girls, who we talked into letting us kiss them if we could catch them? We must face it, some of those girls were extremely fast, but we still considered it worth it to get out of breath if only we could catch them and they would have to kiss us. Do not feel that because you are a bit older now that you cannot still run fast. For example, if you are truly committed, you will have no problem gradually working your way up from doing two sprints per week to doing up to ten per week until you achieve your fitness goals. After this, you can sprint once or twice a week and maintain the level of physical fitness, weight loss and muscle definition you have achieved. My own experience has shown me that it is easy for me to do two or three 50-yard sprints in a row at top speed. However, additional sprints after that become more difficult with each session. 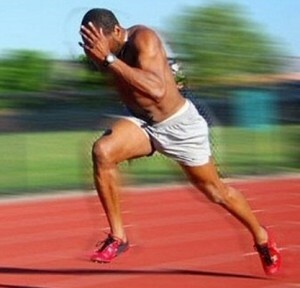 I generally complete my sprints at a football field or on a sprint track. The tracks I choose are 15 minute courses at the most. I would recommend that you do the same and once you master sprinting, you will begin seeing visible results in a short amount of time. This is because sprinting burns a very high number of calories. In my experience, it burns more fat and calories than if you ran on a treadmill as if you were running for your life. Therefore, even if you are one of those people who is struggling to lose body fat and excess pounds and cannot do so even with traditional workouts, you owe it to yourself to try sprinting. For this reason, I do not even count calories when I consume my meals. Of course, this does not mean that I can eat whatever junk food I want any time I feel like doing so and you should not do that either. However, I am confident that I do not need to worry about weight gain when I am participating in high intensity cardiovascular activity on a regular basis, such as sprinting. I still have designated “cheat days,” but I try not to spend money on junk food. If somebody hands me a 12 inch personal pan pizza on a cheat day, I will eat it, but I try to avoid going out and spending money on such food. This is because junk food is bad for you in many ways in addition to causing weight gain, so it is best avoided. 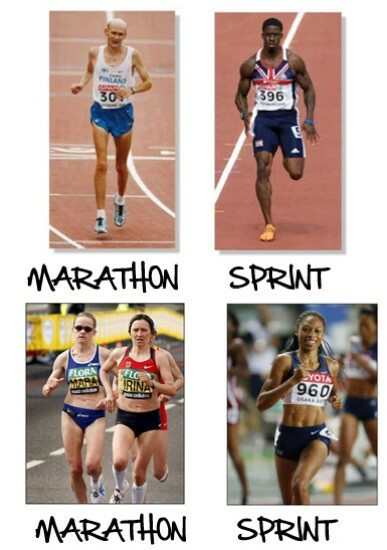 If you would like further proof of why sprinting is the ultimate muscle building and fat burning workout, all you must do is observe the physical differences between long-distance runners and sprinters. It is true that long-distance runners typically have a very low amount of body fat, especially in their legs. Nevertheless, when you look at the bodies of sprinters, they are much more ripped and muscular. This is true not only for their lower bodies, but the upper half of their bodies as well. When I looked closely at these athletes, I definitely prefer the look of a sprinter’s body and have aspired toward the goal of looking the same through this type of exercise. Always remember to warm up, as injuries can occur if you attempt an intense workout without a good warm up first. Pay close attention to your hamstrings, as sprinting sessions can strain the joints. If you give your hamstrings a good stretch, you will decrease your chance of joint or muscle injuries. Here is a good guide on stretching I wrote a few weeks ago. After you learn to properly stretch, your next goal should be to complete speed training drills. Do not overlook these drills, as they are something that every sprinter needs, regardless of his individual goals or the events in which he will be participating. However, if you are a beginner, you should stick to a handful of basic training drills. After you have improved your technique, I suggest doing sprints two or three times every week. This will ensure that you only get better as time goes on. You will be pleased to discover that you do not need to spend a ton of money on footwear and clothes. However, investing in the right athletic shoes is essential, as it will make a tremendous difference in the speed at which you can run. 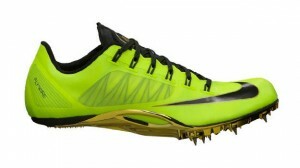 Fortunately, you can purchase shoes that are specifically designed for sprinters. They have sprint spikes on their soles and are usually very light weight, making them perfect for this type of exercise. 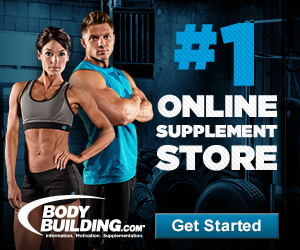 Hopefully, the information and tips outlined above have helped you to reach your muscle building and fat burning goals. 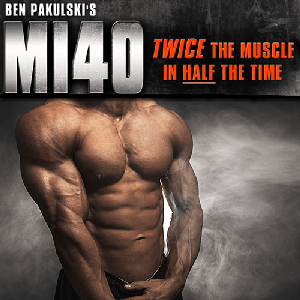 If you want additional tips, check out Tom Venuto’s book called “Burn the Fat and Feed The Muscle.” I have learned a tremendous amount from reading his book, which is one of the best-selling muscle building, fat loss books on the market.